Of course fruit can be preserved by canning and freezing…but another option is to preserve fruit with alcohol. 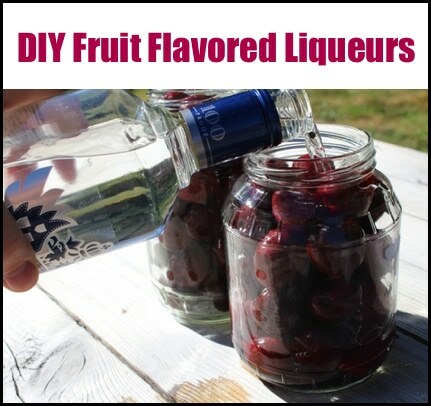 Using alcohol, like vodka or brandy, fruit can be preserved in batches to make delicious flavored liqueurs. Enjoy fruit flavored liqueurs in speciality drinks, as a fruity aperitif in sparkling wine, when roasting, or (our favorite) as dessert topping. Yum! You can use all kinds of fruits from apples, cherries, plums, strawberries, blueberries, cranberries, and citrus fruits. Add in some spices or a vanilla bean and create a new layer of flavor. Over at Sustain Create And Flow, they share their wonderful (and easy!) recipe for creating fruit flavored liqueurs. Learn from them and you’ll be on your way to crafting your own liqueurs, and possibly extending your craft to include herbs too. Enjoy!